Despite what many people believe, corporate branding is much more than just a logo, some colors and a font displayed in a way that looks interesting or quirky. It goes much deeper than that, and a successful branding solution which has been well designed and managed can give an organization’s audience something in which they can believe in, while helping to build and grow its own image. A successful brand should not only be able to communicate an organization’s aims, ambitions, personality, what it does and how it does it, but should also be a reflection of its values and reputation and should be able to clearly communicate what it does differently to its competitors. With the emergence of the interactive media age, where the internet and social media offer so many new ways for organizations and audiences to participate and communicate, many organizations are now expected to be much more effective in how they deliver their image and messages. Having a strong brand image and effective marketing strategy can go a long way to making one organization stand out above the rest. 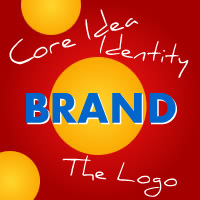 A core idea – the fundamental idea behind the brand which defines the organization as a whole. The logo – the most visible and unique icon, that is easily recognizable and embodies the organizations personality. The identity (or toolkit) – which encompasses a number of visual devices, consisting of imagery, fonts, colors and tag-lines which are used consistently across all media. A fourth element, outside of “design” consists of a marketing strategy, which dictates how and where the organization communicates its messages. Today, more than ever, supporters of the nonprofit sector — just as they are of the consumer market — are much more aware of brands. They are making more informed choices based on them. Arguably, having an effective corporate brand and identity in place can give an organization (be they nonprofit or commercial) the edge over its competition. Further agreement is made in the UK. According to a recent marketing report, increasing numbers of non-profit organizations are looking towards branding and marketing in an attempt to increase their donations and raise awareness. In Rosie Baker’s article Branding is a secret weapon for charities featured in MarketingWeek she noted that: “Macmillan, a UK based cancer charity which overhauled its brand in 2006, has recorded an increase in awareness to 65 per cent in 2011 – up from 31 per cent before the rebrand. Its fundraising income has increased to £141m ($214m) in 2011 up from £97m ($147m) in 2006 and it has been able to help 65 per cent more people suffering with cancer as a result of investing in its brand and marketing, the report adds. Blind Veterans UK, which rebranded from St Dunstan’s, has seen a 31 per cent uplift in response rates to direct mail and a 38 per cent increase in likelihood that the public would consider supporting the charity since the rebrand”. To summarize, having a memorable, well designed logo backed up by a strong core message, a consistent identity which clearly reflects the aims and personality behind an organization can go a long way to helping any organization stand out amongst an ever increasing and brand savvy crowd. See Mike’s profile on Linkedin, or send an email to the address above for more information.